Pretty much anyone who has put content online has encountered it. Someone takes your content and puts it on their own website. They might be generating ad revenue from your content or they might just be trying to gather good content (as opposed to generating good content) to that their site looks good. Whatever their reasons, their theft of your content has serious repercussions. Beyond simple copyright theft, search engines can knock sites down if it sees the same content on multiple websites. If a content thief takes your content, it could mean that you actually get dinged in the search engine rankings. Thankfully, content owners have a recourse via the Digital Millennium Copyright Act (DMCA). The DMCA says that copyright owners who find their content online without permission can send a letter (DMCA takedown notice) to the person or company hosting the material. The person/company then must take down the material. Once they do, the person who put the content online can then either accept that the material was taken down or contest this takedown. Once they contest it, it is a matter between the poster and the copyright owner. The hosting company is off the hook and isn’t involved. This is a good thing. Were this not the case, the mere act of letting users put any content online would be too much of a lawsuit risk. The Internet as a whole would grind to a halt. Sadly, however, DMCA requests can be abused. 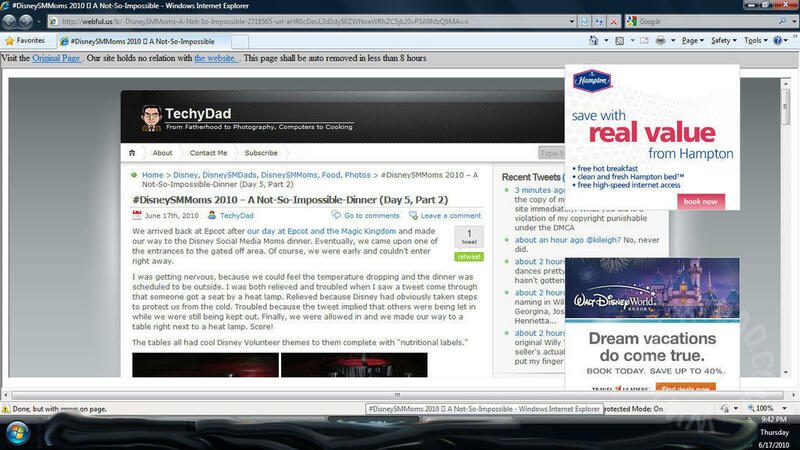 Recently, Retraction Watch, a blog run by Ivan Oransky and hosted on WordPress.com, found many of their postings gone. After doing some investigating, it turned out that one of the subjects of his postings, a cancer researcher who was being investigated for fraud in his research and inaccuracies on his resume wanted to improve his online reputation. To improve his online reputation, the cancer researcher hired a company. The company copies Retraction Watch’s content. Then, they filed DMCA takedown notices with WordPress, claiming the content was their own. WordPress complied and the content was deleted. Now, Retraction Watch is trying to recover their lost content. This is, understandably, very worrying. Theoretically, false DMCA takedown requests constitute perjury. Practically, though, there is no penalty for filing a false request. 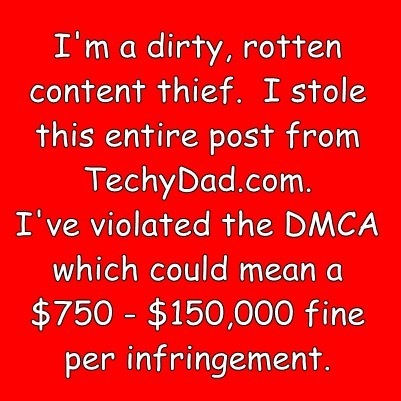 How many more people will find their content gone via DMCA takedown because some person or company doesn’t like what they posted? How many content thieves will steal content and then try to take the originals down to bolster their claim over the stolen content? How can you protect yourself? The best way is to always back everything up locally. This way, even if you are struck with a malicious DMCA takedown notice, you won’t actually lose any content. If you are running a self-hosted WordPress blog, there are many plugins that you can use to back up your database. (I prefer WordPress Database Backup.) If you are on WordPress.com or Blogger.com, this site has some recommendations. Even if you think you can trust your host, it is a good idea to back up. You never know when a malicious DMCA request will come your way and it is the best method of protecting yourself. 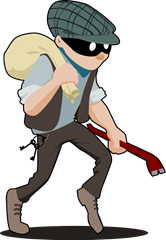 NOTE: The burglar image above is by tzunghaor and is available from OpenClipArt.org. It is almost inevitable if you put content online. At one point or another, someone will steal it. Sometimes, it is someone stealing your words and claiming they are your own. Sometimes, it is a company taking the photo you posted, stripping any watermark off of it, and using it for their brochure. Usually these people will claim "the web is considered ‘public domain’" – a total falsehood. In my mind, though, the most annoying content thieves are the spammer/scrappers. These people troll the Internet looking for content to grab. They gobble it up and repost it on their own sites/blogs with varying levels of attribution. They use this content to gain Google ranking so that either 1) they get more money from ads, 2) their links to other sites get better ranking, and/or 3) their domain name becomes more valuable when they sell it. While they are grabbing your content, they are doing much more damage than simple copyright infringement. The duplicate text could not only help the thieves raise their Google ranking, but could also drag yours down. In most of these cases, you are powerless to actually get the content removed. You can send a cease and desist notice, mentioning that the copying is a DMCA violation that can result in a $750 – $150,000 fine per infringement. Sadly, there are some content thieves who are stationed overseas and either ignore or laugh off any legal threats. When you encounter a situation like this, you can’t do anything. Well, unless they hotlink your photos. Like the thieves we discovered on Sunday who stole B’s entire blog post. Then, you can replace the photos with something "fun." It’s a simple matter of editing your ".htaccess" file. This file is very powerful and can tell the web server just who to allow to access content and who not to allow. You can prevent hot-linking altogether, but I wouldn’t recommend this. Blocking all hot-linking might make your posts show incorrect images when they are linked to on Pinterest, Facebook, and/or Google+. Of course, that link could contain anything, not just a bunch of text. You could put a shot of an angry face, someone collating papers, or even something highly crude. Will this get your content taken down? No, it won’t. But at least you will get the satisfaction of seeing the thief’s site "defaced" with your message proclaiming to all that stumble upon them that this site is a dirty, rotten content thief. Aloha Friday: Spammers, Scrapers and Thieves, Oh My! I had a great Aloha Friday question all lined up, but it’s going to have to wait. As I was headed home, I got a call from B. 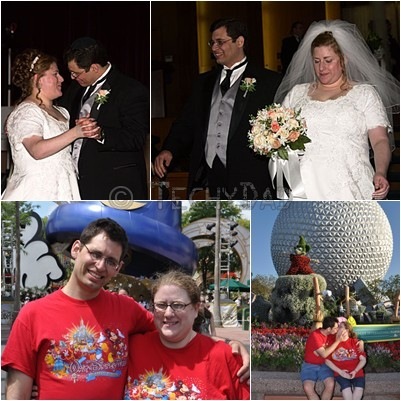 She searched Twitter for #DisneySMMoms and found a tweet from a user named EsterlDode titled "#DisneySMMoms 2010 – A Not-So-Impossible" followed by a URL. Now, she recognized this as the beginning of my latest DisneySMMoms post so she clicked the link wondering what she would get. She was greeted by my webpage. Except it wasn’t my webpage. Thank you for contacting Toyota with your comments and concerns regarding the use of vehicle images. The letter asking the DesktopNexus site to remove all images featuring a Toyota, Scion or Lexus vehicle was the result of mis-communication at Toyota, which we regret. Copyright law protects the creative work product of artists, photographers, and other creators. Toyota respects these rights, including those of photographers who work with Toyota. Toyota purchases the rights to the images it posts on its sites, and welcomes public use of those images where we have the rights to give. However, this permission is limited to editorial or personal use, not commercial use, such as advertising any products or services. That’s because the photographers – not Toyota – retain the rights to any commercial use, and we cannot give permission to use those images for that purpose. In response the concerns raised by DesktopNexus, Toyota is working with photographers to determine what images may be used for non-commercial purposes, and what we can do to provide broader access. We hope you will understand and appreciate the legal constraints we face. Toyota also welcomes interested members of the public to use their own images or photography of Toyota’s vehicles, and we confirm that we have no objection to this use. We found a couple of legitimately infringing photos on your site but rather than give you specifics we decided to be lazy and just order them all down. We figured you’d just roll over and take it, but then you had to spread the word. Now we’re facing a ton of bad PR so we’re going to limit our claims to just those originally infringing photos. There’s this website called Desktop Nexus that allows users to post photos for other people to use as their desktop images. Apparently, Toyota recently decided to order Desktop Nexus to take down "all wallpapers that feature a Toyota, Scion, or Lexus." Toyota has used a DMCA (Digital Millenium Copyright Act) notice to frame their demand, so they’re clearly claiming copyright over photos that contain those cars. According to Toyota, if I posted a photo of my Toyota automobile on here (or on my personal blog or anywhere else), Toyota could sue me for copyright infringement. It wouldn’t matter that my car is completely my own (completely paid up). Since Toyota once put the car together, they claim to own perpetual rights to how that car is represented photographically. If Toyota gets away with this, where does it end? Can Coke sue me if a coke can appears in a photo online without their permission? Does Old Navy sue me because my photo subject happens to be wearing an Old Navy shirt while posing for a photo? Look for a photo of my Toyota car to appear on this blog soon as protest. I call on all Toyota car owners to post photos of their cars to join in the protest. Non-Toyota car owners can snap a photo of the nearest Toyota car. Be considerate, though, and don’t show anything "personally identifying" about the vehicle like license plate number.